Photoinduced long-period fiber gratings (LPG) with periods LLPG = 102 - 103 mm were proposed in . Such gratings couple the fundamental mode with the cladding modes of the fiber, propagating in the same direction. The excited cladding mode attenuates in the coated fiber part after the grating, which results in the appearance of resonance loss in the transmission spectrum. In contrast to Bragg grating, LPG does not produce reflected light and can serve as spectrally selective absorber. where k is an integer describing the order of the grating, in which the mode coupling occurs. Calculation methods of spectral characteristics of LPGs can be found in papers [4, 5]. Below we will consider the most important relations describing the grating properties. where neffcore and neffclad are effective refractive indexes of the core and cladding modes, respectively, and lLPG is the resonance coupling wavelength. where a is the core radius, Еcore and Eclad are the amplitudes of the electrical field of the core and cladding modes, respectively, r and j are radial and azimuthal coordinates. The overlap integral I defines the efficiency of inter-modal conversion. Its value is large only for HE1m (m > 1) cladding modes, because only these modes have a sufficiently great electric field component in the fiber core. Fig.1 shows the energy-normalized radial distributions of the electric field for some of HE1m cladding modes . These modes are linearly polarized, their intensity distributions are axially symmetric, and the number of zeroes in the radial direction is m - 1. The overlap integral increases with increasing the radial mode number up to m ~ 10, which is accompanied by an increase in the inter-modal coupling intensity. The latter can be seen from the transmission spectra of LPGs (Fig.2). Starting with a certain value of m, the overlap integral decreases to zero and thereafter oscillates with m, the amplitude of the oscillation tending to zero . Dnmod is the induced index modulation amplitude of the fiber core, related with the total induced index change Dnind via relation Dnmod = Dnind/2, C is a constant equal to the first coefficient in the Fourier transform of the grating pitch shape. If the index profile is sinusoidal, this constant is equal to unity. For a rectangular profile, which is more typical for LPG, C = 4 sin(pd/L)/p, where d is the size of the irradiated part of the fiber within one grating period. Equation (8) allows one to obtain Dl0 in the assumption of a constant Dneff within the grating bandwidth. However, the presence of dispersion of Dneff in some cases can give a significant discrepancy between the experimental bandwidth and the calculated one. In  it was shown that the first term in Dneff expansion into a Taylor series in the vicinity of lLPG is sufficient to estimate the bandwidth to an acceptable accuracy. As mentioned above, the standard diameter of silica cladding is large enough and the cladding can guide plenty of modes. An LPG allows selective excitation of an individual cladding mode. This fact makes it possible to investigate the field distribution of the cladding mode excited by the grating. Fig.3. Near-field intensity distributions of HE1m cladding modes with m = 4 (a), 5 (b), 6 (c), 7 (d), 8 (e), 10 (f). Fig.3 shows the intensity distributions measured by the near-field technique for a group of cladding modes . All the modes, as follows from theoretical consideration, have pronounced axial symmetry, which corresponds to azimuthal number l = 1. The number of rings is equal to the radial mode number m.
A. M. Vengsarkar, P. J. Lemaire, J. B. Judkins, V. Bhatia, J. E. Sipe, T. Erdogan, "Long-period fiber gratings as band-rejection filters", OFC'95, PD4-2, 1995. T. Tamir, ed., "Integrated Optics", Vol.7 of Topics in Applied Physics, Springer-Verlag, 1975. T. Erdogan, "Fiber grating spectra", J. Lightwave Technol., 15, pp. 1277-1294, 1997. S. A. Vasiliev, E. M. Dianov, A. S. Kurkov, O. I. Medvedkov, V. N. Protopopov, "Photoinduced in-fibre refractive-index gratings for core-cladding mode coupling", Quantum Electron., 27, pp. 146-149, 1997. T. Erdogan, "Cladding-mode resonances in short- and long-period fiber grating filters", J. Opt. Soc. Am. A, 14, pp. 1760-1773, 1997. H.-G. Unger, "Planar optical waveguides and fibers", Oxford, Clarendon Press, 1978. T. Erdogan, D. Stegall, "Impact of dispersion on the bandwidth of long-period fiber-grating filters", OFC'98, OSA Techn. Dig. Series, 2, pp. 280-281, 1998. 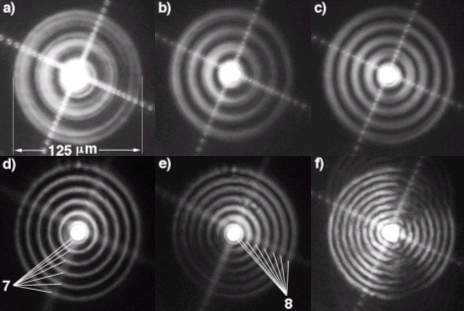 S. A. Vasiliev, E. M. Dianov, O. I. Medvedkov, V. N. Protopopov, D. M. Costantini, A. Iocco, H. G. Limberger, R. P. Salathe, "Properties of the cladding modes of an optical fibre excited by refractive-index gratings", Quantum Electron., 29, pp. 65-68, 1999.